Andy Beckstoffer has been single-minded in his pursuit of success, even courting financial disaster only to bounce back through brass-knuckle business savvy and swagger to become one of Napa Valley's ultimate insiders. South Africa: A free chart offers an alphabetical list of all South African wines reviewed for the tasting report in this issue. Long Island: A free chart offers an alphabetical list of all Long Island wines reviewed for the tasting report in this issue. WineSpectator.com: BONUS VIDEO Beckstoffer's To KalonNapa Cab Central: What makes the To Kalon vineyard so special? Grapegrower Andy Beckstoffer takes us on a tour of his To Kalon vineyard, and winemakers Fred Schrader, Mike Hirby and Mark Carter talk about why they rely on Beckstoffer's grapes. FREE: South Africa Alphabetical Listing - More than 400 wines were reviewed for this report. A free alphabetical list is available. WineSpectator.com members can access complete reviews for all the wines tasted using the online Wine Ratings Search. WineSpectator.com: Find restaurants with great wine lists in our Restaurant Search. With more than 3,500 award winners, pick the perfect dining spot by location, award level, wine strengths, cuisine type and more at restaurants. WineSpectator.com: Always on the hunt for a bargain? Download Wine Spectator's free Xvalues app, highlighting high quality, widely available wines at affordable prices. This easy-to-use app for iOS features Wine Spectator's latest reviews in several categories: $12 or less, reds and whites at $20 or less, sparkling values, and seasonal picks. Find it in the App Store. FREE: Long Island Alphabetical Listing - More than 190 wines were reviewed for this report. A free alphabetical list is available. WineSpectator.com members can access complete reviews for all the wines tasted using the online Wine Ratings Search. 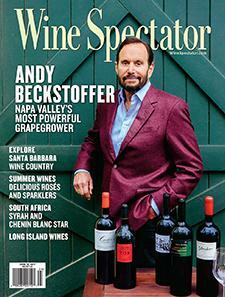 WineSpectator.com: Want more from Dr. Vinny? Our advice expert provides saucy answers to all sorts of questionsfrom tough topics about the technical aspects of winemaking to the finer points of wine etiquettethree days a week on WineSpectator.com. Submit your questions at www.winespectator.com/drvinny or on Twitter via @AskDrVinny. PARTY PLANNING Hosting a barbecue bash on Memorial Day? We highlight delicious new recipes to try and point you to great wines for the occasion. Check out our seasonal features for pairing suggestions with well-priced, newrelease wines recommended by our editors. WINE PICKS Get our latest editors' picks and thousands of other new reviews on the go with the WineRatings+ app, which offers access to Wine Spectator's expert ratings, as well as curated lists and top values. The newly revamped version for iOS includes enhanced vintage charts and news feed. Find WineRatings+ at the App Store or Google Play. Quick Tip—Why Most Wine Bottles are Green: There are three very good reasons that so many wines end up in a green-tinted bottle. Find out why when it comes to wine bottles, it's easier being green. Behind the Scenes—Maryland Crab Soup: Take a peek into a Wine Spectator photo shoot and pick up food-pairing pointers with our "A Perfect Match" series. This segment focuses on this issue's spicy Maryland crab soup. 2016 BORDEAUX BARREL TASTINGS Following 2015, the 2016 growing season provided Bordeaux with its first excellent back-to-back crops since 2009 and 2010. Which wines should you buy as futures? Senior editor James Molesworth visited the region to taste barrel samples of the young wines. Read his blog posts for highlights from top châteaus. Plus, get his scores and tasting notes for hundreds of reds, dry whites and sweet wines. 356,000+ WINE REVIEWS Use our powerful search to find the latest scores and tasting notes, check your cellared wines to see the recommended drink window and their latest auction prices, or delve into the historical performance of the world's great collectibles. We've got it all! HAVE YOU SEEN THE XVALUES APP REDESIGN? Wine lovers want great quality, but also value. To help you find great deals when you're shopping, try Wine Spectator's free, recently redesigned Xvalues app, highlighting high quality, widely available wines at affordable prices. This convenient, easy-to-use app for iPhone and iPad features a regularly updated library of Wine Spectator's latest reviews in several categories: top values for $12 or less, reds for $20 or less, whites for $20 or less and sparklers for $40 or less, plus seasonal and holiday picks. Before your next shopping trip, download it from the App Store!